Source: CICH graphic created using data adapted from Statistics Canada. Table 153-0148 – Households and the environment survey, parks and green spaces, Canada, provinces and census metropolitan areas (CMA), every 2 years (percent). http://www5.statcan.gc.ca/cansim/a26?lang=eng&retrLang=eng&id=1530148&&pattern=&stByVal=1&p1=1&p2=31&tabMode=dataTable&csid= -accessed July 26, 2017. 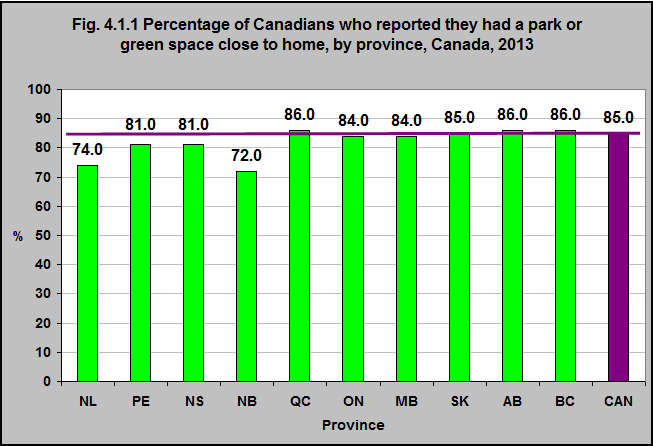 The majority of Canadians – 85% – reported that they live close to a park or green space. This varied by province – from a low of 72% in New Brunswick to a high of 86% in Québec, Alberta and British Columbia. 1Kuo M (2015) How might contact with nature promote human health? Promising mechanisms and a possible central pathway. Front. Psychol. 6:1093. doi: 10.3389/fpsyg.2015.01093. 2Wade C. Nature Deficit and Health in the Pediatric Population: a Critical Appraisal. February 2014. http://cape.ca/wp-content/uploads/2014/10/Nature-Deficit-Research-Project-C.-Wade-2014.pdf – accessed July 27, 2017.